The racecar was designed and built by Joe Iacono of Iacono Design and Jeremy Lookofsky of Cartel Customs. The FR-S Speedster will not only be featured at the race but also prominently on a limited edition poster commemorating the day’s event. If you’re there, look for the car at the Lifestyle Expo lobby on Friday or Saturday, and then Sunday it will serve as the official Grand Marshal vehicle on Sunday, escorting Parnelli Jones as the IZOD IndyCar Series race Grand Marshal. 2012 Long Beach Motorsports Walk of Fame inductee Scott Pruett will be at the wheel. The Scion FR-S Speedster will be at select appearances after the race. The custom showpiece resulted from a sweet deal between Toyota and its youth-oriented Scion brand. The FR-S Speedster takes its DNA from the 2013 Scion FR-S, a rear-wheel-drive sports car that is Toyota’s ultimate exercise in balancing performance and handling, compelling style and flexible utility with startling fuel economy. The FR-S itself gets most of its inspiration from the nearly legendary AE86 Corolla, better known as the “Hachi-Roku,” Japanese for “eight-six.” A virtual Haiku in metal, the car was an attempt to achieve pure balance via compact size, oblique shape and the strategic implementation of the world’s only flat boxer engine in a front-engine, rear-wheel-drive configuration. Cartel Customs styled the Speedster while listening to Prince singing “Let’s go crazy,” but didn’t forget Toyota’s rich racing heritage in the process. 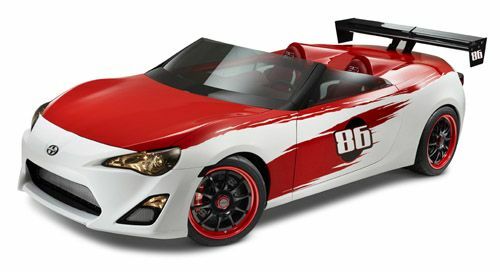 The vehicle proudly wears 86 on its door panels and rear wing, along with Toyota Racing’s iconic paint scheme. Cartel added their Traditional Signature Series Chop Top, tweaked the front fenders and hood, put on a unique rear deck with custom sheet metal speed blisters, plus one-of-a-kind metal fabricated interior and exterior panels, APR Performance Custom 61” carbon fiber (CF) spoiler wing, and made to order formed and cut glass front windshield and side door glass. Inside you’ll find custom-shaped metal door panels with CF insets, a rear panel CF false wall, plus a modified dash center drive gauge cluster and CF switch panel with (what else?) red and white accented seats, dash and center console. Toyota will also host a live art event on Saturday, April 14 at 1:00 p.m. in the Lifestyle Expo lobby. Urban artist Justin Bua will recreate the scene on site featured in his commemorative poster for the race. Grand Prix fans are invited to take part in the live recreation. Though not participating in the Gran Prix, the FR-S Speedster will be on hand to represent Toyota Racing at the event.